The noted musical revue Raiding The Rock Vault, performing at the New Tropicana Las Vegas, featuring a RoomMatch® loudspeaker system from Bose® Professional. Photo courtesy of Raiding The Rock Vault. © 2015. Framingham, MA, July 7, 2015 – A RoomMatch® loudspeaker system from Bose® Professional has been permanently installed in the Tropicana Theater inside The New Tropicana Las Vegas, the home of the noted musical revue Raiding The Rock Vault, which features a supergroup of rock royalty from bands such as Whitesnake, Bon Jovi, Heart, Survivor, The Offspring, Quiet Riot, Asia and Badfinger, and a set list that includes classic anthems from such legends as The Rolling Stones, Led Zeppelin, AC/DC, Bon Jovi, Journey and more. Working with the show’s Production Manager Keith Marks, Bose Professional personnel took a hands-on approach to designing the system for the venue, using Modeler® sound system software to fine-tune the configuration to ensure even coverage throughout the space. Bose then collaborated with the IATSE union to install and tune the system. The venue seats approximately 1,200 and there is just one level of seating (though there is an upper area with lighting and other equipment that creates somewhat of an under balcony area). Booth seating at the front of the room offers a VIP experience. Bose products installed include two RoomMatch arrays with eight modules each (from top to bottom, one RM9005, four RM12005, two RM12010 and one RM12020), each flanked by a five-module RMS215 bass array; eight RoomMatch RMS218 subwoofers centrally arrayed on the floor under the stage thrust; RoomMatch single-array modules (RM9040) paired with RMS215s used as side fills for the musicians; RoomMatch Utility RMU208 loudspeakers used as stage monitors for those musicians not using in-ears; and 31 PowerMatch® PM8500N amplifiers with three ControlSpace® engineered sound processors using Dante™ networked audio driving the loudspeaker system. Additionally, Bose has been fortunate enough to be able to use the theater as a demo site and/or testing lab, either setting up new configurations and measuring the performance of new or prototype products, or previewing the existing system for contractors, system integrators, design consultants and FOH engineers. Raiding the Rock Vault is The Story of Classic Rock, performed by members of some of the greatest rock bands in history – a two-hour classic rock concert experience that transports the audience from the 1960s to the 1980s with classic anthems from rock’s top acts. This fully live concert experience features a stunning light show, video screens, actors, DJ Narrator, and high quality concert sound production. Voted Best of Las Vegas 2014 and 2015 in the Review-Journal’s Reader’s Poll and called “a fantasy football team in the form of a rock band” by Hollywood Underdog. 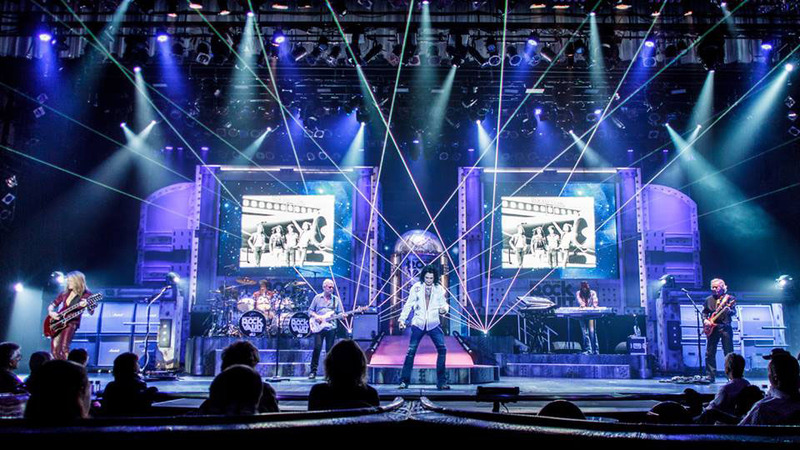 Photo Caption: The noted musical revue Raiding The Rock Vault, performing at the New Tropicana Las Vegas, featuring a RoomMatch® loudspeaker system from Bose® Professional. Photo courtesy of Raiding The Rock Vault. © 2015. The Bluetooth® word mark is a registered trademark owned by Bluetooth SIG, Inc. and any use of such mark by Bose Corporation is under license. Audinate® is a registered trademark of Audinate Pty Ltd. Dante™ is a trademark of Audinate Pty Ltd. App Store is a service mark of Apple Inc.